Greetings, It's been a long time. I seem to be quite aweful at keeping my word, and keeping up with my blog. That is going to change as I am going back to school, have had some recent commissions, and a more reliable source of connection to the net now. So... with that I wanted to post a bit of my musings from different Art Fairs I have had the pleasure of attending this Summer. The first three photos you see are of Milwaukee's Lake Front Art Festival. 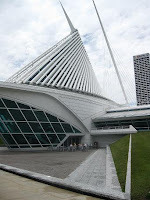 I love this art fair, because not only is it right next to the Milwaukee Art Museum, but it is on Lake Michigan as well. 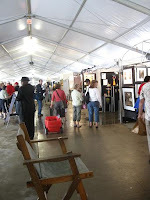 All of the artists participating have booths inside a large tent, so rain or shine the show goes on! 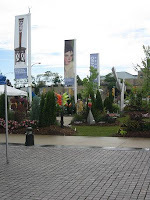 There are art demonstrations, music, food, and admission to the Art Museum is half off with admission to the Festival. I highly recommend this show if you happen to be in the area. 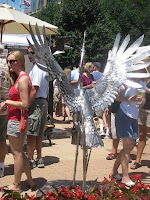 Second, is Madison's Art Fair on the Square. Another great fair, all booths are outside, under individual tents, right off of the Capitol on the square. 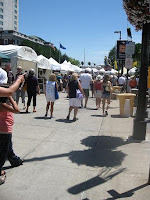 Outdoor food vendors, live music, and great location downtown also makes this one of the best art fairs in Wisconsin. As always these shows and others I have attended have inspired and reinvigorated the need to not only create more work, but to do so without excuse. Art makes the world more beautiful, it gives us all a place to celebrate the act of creating. I am working on a new series of cityscapes, and will be posting images in the following weeks. I hope you visit again, and send this with love and gratitude to you..the reader.